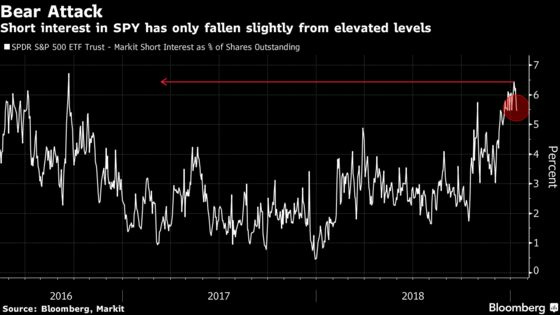 (Bloomberg) -- Fast-money traders have proved hardened skeptics on the heels of a once-in-a-decade stock rally, suggesting short-covering and bottom-fishing drove a market rebound that’s now losing steam. As caution grips automated and discretionary strategies alike, trend-following quants and hedge funds largely stayed on the sidelines over the past two weeks. Momentum-driven investors known as commodity trading advisers, or CTAs, further cut exposures to U.S. equity futures, judging by the portion of their returns attributable to the index, a measure known as beta. A similar gauge for hedge funds remains a whisker away from a seven-month low. Meanwhile, short interest in the world’s largest exchange-traded fund tracking the S&P 500 is close to a two-year high. It all underscores a lack of faith in the strongest performance for U.S. stocks since 2016 -- a view that may be reinforced by this week’s first day of trading. Equities retreated in New York on Monday morning after weak Chinese data reignited concerns over global growth. “It will be very audacious to declare risk-on is back considering the recent batch of economic data and profit warnings in the U.S. and Europe,” said Stephane Ekolo, equity strategist at TFS Derivatives in London. 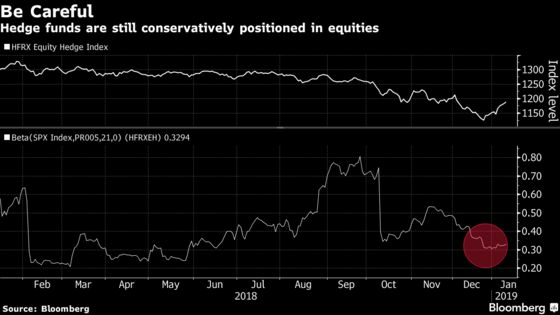 Leveraged quantitative investors -- known as risk-parity and volatility-targeting funds -- have also yet to capitulate en masse as they await market stability, according to Deutsche Bank AG. On the flipside, according to JPMorgan Chase & Co., some of the fastest traders in the market have plenty of ammo to help fuel a sustained rally. 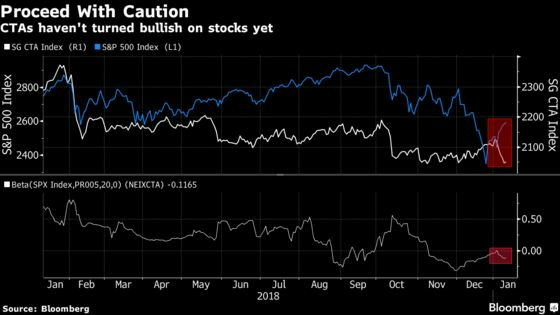 For now, the tea leaves suggest that a rush of short-covering may be the proximate cause for the recent leg-up in stocks: A basket of the 50 most-shorted shares in the Russell 3000 has outperformed the benchmark by six percentage points since late December.